Leaguettes All, Look at THIS! The ORIGINAL world TV premiere advertisement for TSP1982. I'm pretty close to drooling right now. Since I first met The Scarlet Pimpernel a year and a half ago, I've loved reading Baroness Orczy's original books. Although I soon found many others who loved it just as much as I did, I never found a single bit of good published TSP fanfiction. Needless to say, I was delighted when I stumbled upon Literary Maidens Publishing and saw that Melody Grubb had published a TSP fanfiction story, The Land of Calais. Nothing but a promise from the legendary Scarlet Pimpernel himself would have induced Jeanne Andole to leave France before her family was brought to safety. With that promise, she moves to England and joins high society, beginning a friendship with Lady Blakeney. Yet time goes by and her family does not appear. She begins to wonder who the Scarlet Pimpernel actually is and why he has not rescued her family. In the middle of this perplexity Jeanne meets Chauvelin and that can only lead to trouble. 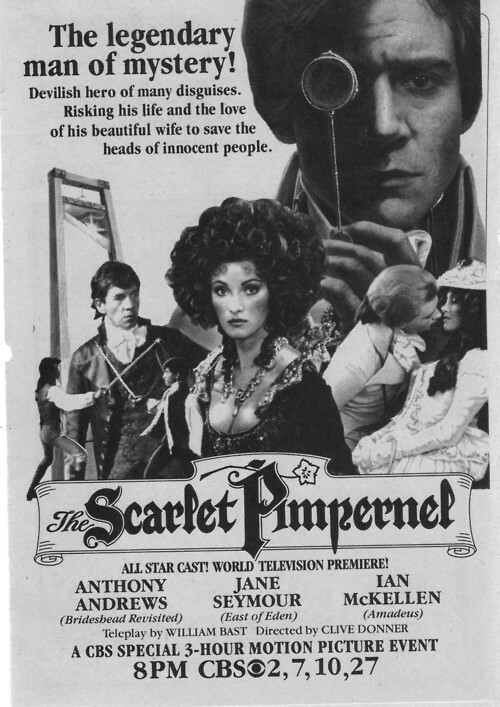 Before long Jeanne is back in France, trying to rescue her endangered family since it seems the Scarlet Pimpernel will not. Unfortunately, Chauvelin, back to his old revolution-supporting activities, is eager to use the situation for his own advantage. 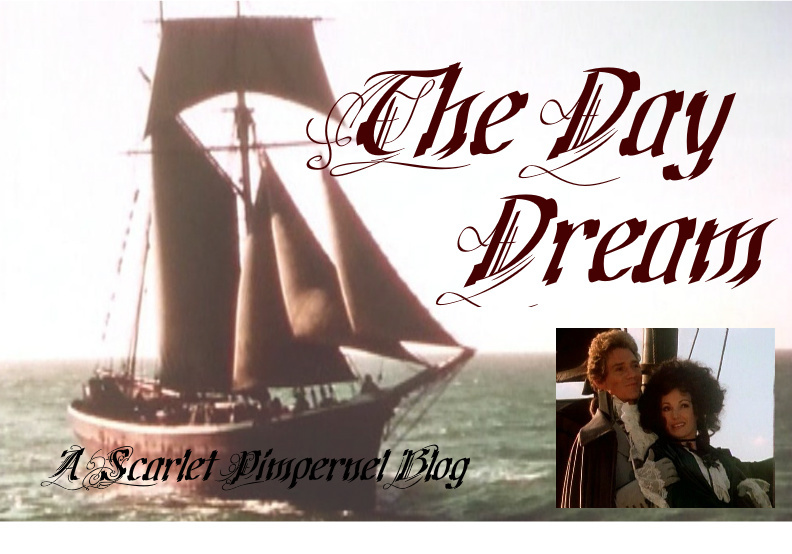 Soon Jeanne’s whole family is under arrest – and it seems there is nothing the Scarlet Pimpernel can do to help them. This is a lovely little book. Jeanne, with her strong faith and a tendency to jump into situations, is easy to relate to. Sir Percy is as laughing and self-deprecating as ever, with thankfully less of those minced oaths that I've always considered the worst of the TSP books. Chauvelin is as evil as ever. Marguerite has just enough of a comeo to keep me happy, as does Lord Anthony Dewhurst. I liked how this book was written too, with delightful echoes of Baroness Orczy's books mingled in with Melody's own writing style. At 71 pages, I suppose The Land of Calais could be more accurately called a novella. A few times (especially when there were Certain Happenings near the end) I found myself thinking that the story would have been better if it was drawn out a little more, but hey, don't we all want nice books to be longer? In conclusion, this sweet little book is not only a trip back to the world and characters of the TSP stories, but also an exciting tale in its own right. 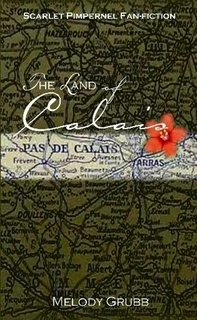 If you've ever been wishing there was more TSP fanfiction, you should definately look into The Land of Calais! Disclaimer: Many thanks to Melody Grubb of Literary Maidens Publishing for giving me a review copy! All opinions are my own. Here, in a few sentences, the whole purpose of the League from the lips of its gallant founder himself. I can read this over and over! The Pimpernel, in his last great performance (and gut-wrenching scene!). My heart still jumps at the gunshots. From TSP 1982. One question has intrigued me that was brought to life by this story. In the same situation, what would I do? Would I risk my life and possibly reputation to save other people, some of whom I may not even know? The Pimpernel and his band were not evading the clutches of merely anyone… they were defying the orders of a new government. They perhaps had a dilemma; to respect the rulings of the new government even to the point of not looking twice at the many deaths they caused (as most aristocrats in England certainly did), or defy the new government to save the lives of many, risking their own in the process. They were not against the coming of a new government, but they were opposed to the methods it chose to employ. As we know, they did defy the new government, for saving the lives of others was more important to them than saving their own necks and simply turning a blind eye. In those days one denunciation was sufficient: Marguerite’s few thoughtless words anent the Marquis de St. Cyr bore fruit within twenty-four hours. He was arrested. His papers were searched: letters from the Austrian Emperor, promising to send troops against the Paris populace, were found on his desk. He was arraigned for treason against the nation, and sent to the guillotine, whilst his family, his wife and his sons, shared in this awful fate. They certainly had the option to do nothing… they were required to do nothing. As members of high society, their lives were preferable, were “set”. Being Englishmen, they would not be touched by the atrocities of France, except perhaps to lose some good friends (not to say that is minor!). But they could have stayed, in their comfort, in peace. The answer to that second question, by the Scarlet Pimpernel and his band was, decidedly, NO. [Marguerite, thinking of the Scarlet Pimpernel] Ah! There was a man she might have loved, had he come her way: everything in him appealed to her romantic imagination; his personality, his strength, his bravery, the loyalty of those who served under him in that same noble cause, and, above all, that anonymity which crowned him, as if with a halo of romantic glory. What do you think of their moral/ethical dilemma?